The s100HD WorldViewTM 1m antenna provides exceptional coverage and performance for DIRECTV service in North America as well as service around the world making it the perfect choice for vessels traveling between the Mediterranean, US, and Caribbean. 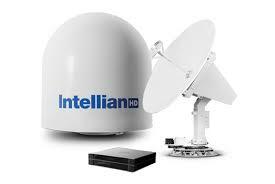 Intellian’s WorldView Trio LNB™ with its triple feed horn provides simultaneous reception of DIRECTV US satellites: two HD DIRECTV Ka-band (99°W/103°W) satellites and one DIRECTV Ku-band (101°W) satellite. In addition, the LNB receives Ku-band TV service around the globe providing a complete HD entertainment experience at sea, including DVR capability. The s100HD WorldView™ antenna system contains a built-in global satellite library that contains regional satellite data wherever you are. The library makes it simple to load your satellite providers specifications from around the globe making it easy to enjoy your favorite programming in no time. The s100HD’s radome matches the styling of Intellian’s v100 and GX100 VSAT antennas, making a perfect solution for larger yachts or whenever there is an emphasis on symmetrical design. The v100 and GX100 are the most popular VSAT antennas on the market today, making them perfect match for those who also need voice, high-speed data, and fax services. Easily connect to the Wi-Fi enabled ACU with Aptus Mobile that enables simple system control and monitoring,, including OneTouch Satellite library and firmware updates. Aptus mobile is available From the App Store for iPhone and iPad, or Google Play for Android devices. Intellian s100HD WorldViewTM comes with an Intellian 19” rack mount Multi-Switch module that allows you to seamlessly connect various types of satellite receivers. The built-in SWM capability simplifies installation by supporting single wire installation to multiple TV receivers, eliminating the need for additional hardware and cable runs.